Plastic toys in plastic bags on children’s comics? Really? When I was little and one of eight children, my bedroom was usually at the front of our house, where there was a gravel drive, so my favourite day of the week was Thursdays (even more so in the school holidays, of course! ), when I could hear the approaching footsteps of the paper boy with our comics. Between us we had The Eagle, The Beezer, Dandy, Beano, Bunty and Jackie. I think we got Look and Learn at school. 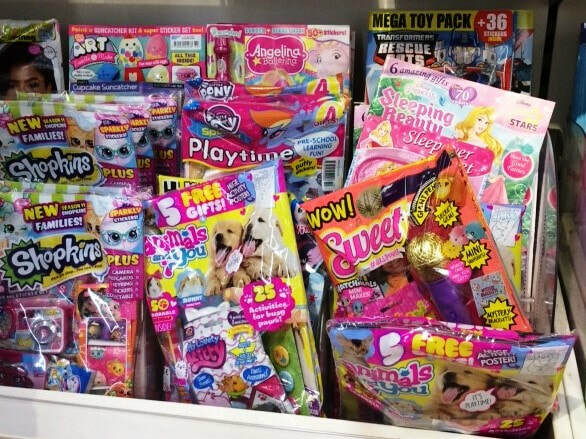 Later in life, when our son was unwell, in addition to his usual comic, I’d pop out and get him an extra one from the local newsagent as a treat, so when my little granddaughter, three years old, was unwell recently, I thought I’d get her one – she loves drawing and is also showing a lot of interest in reading. However, when I had a look at what was on offer I was really taken aback. Every single comic was not only wrapped in plastic but also had a plastic toy attached. When I was a kid, you’d get the very rare free gift with a comic, maybe once a year, and it was usually stuck on the front with a bit of glue. If you’re the right age, you’ll remember the kind of thing: a little Princess ring, or a paper device that made a bang when you gripped it and threw it forward. In this time of crisis, when children worldwide are taking to the streets to demand climate action, right now, calling for us to reduce the impact of human over-consumption on our planet, and when David Attenborough and eminent scientists have laid out the devastating reality of the irreparable damage already done to planet Earth, and the legacy of our wasteful civilisation, bequeathed to our children and any future generations to deal with, it’s hard to believe that publishers of children’s comics can be so blind to all this that they are producing further mountains of plastic to be, eventually, tipped into the sea or landfill sites. Boycotts can be very effective. May I suggest to all those who care enough, that you take the small steps of not only boycotting children’s comics until this practice is stopped, but also letting the publishers and retail outlets know of the action you’ve taken. In the meantime, you could go to the public library every week and get out a book (they really need our support), or if you can’t access a library, buy a second-hand children’s book once a week from a charity shop? ​When my favourite item in the Waitrose Weekend paper (My Best Books) was chopped to just one book a week from five, I really missed it - I just love to hear what other people rate their cherished reads, so I decided to start my own guest-blog along the same lines. A feast of 70's San Francisco served up through the adventures of a diverse group of characters centred around the enigmatic Mrs Madrigal. Quirky, amusing and touching - I loved the book and its sequels well before I finally got to San Francisco and explored the locations so vividly depicted. The film of this book introduced me to the works of Anne Tyler. Her sensitive observations of everyday minutiae build into portraits of characters for whom you really care as they navigate the emotional pitfalls of relationships and everyday life. No two books by Rose Tremain are ever remotely the same. This captivating novel is set in 1629 when a young English lutenist joins the Royal Orchestra of the melancholic and idealistic Charles IV of Denmark and falls in love with a lady-in-waiting. The intricacies, intrigues and passions of the protagonists and court life are brilliantly painted - with Kirsten, the King's adulterous Consort, a particularly charismatic and memorable character. Quite different from the "Wallander" books for which he is probably best known, this novel begins on the frozen wastes of a Swedish island where a recluse is forced to undertake a physical and spiritual journey to confront his past and its consequences. Both interior and exterior landscapes are hauntingly realised. Being one of the "Godless students of Gower Street", I have always been fascinated by the Bloomsbury Group. Set during two visits to Skye, ten years apart, relationships and experiences are perceived through the mind's eyes of the Ramsay family and their guests. Emotions and thoughts constantly shift as each moment passes. It is lyrically written and the interlude "Time Passes" is as near to poetry as prose can get. I wonder how many people who take their children to see the ducks at Holden Pond in Southborough, or go fishing there, stop to read the memorial to Walter Clary. Sadly, although I did once encounter Walter, I missed the chance to get to know a truly memorable man. He had knocked on our door canvassing for the Labour Party. I told him that my husband and I had always voted Labour, but that in the light of Tony Blair having led Britain into the Iraq War by relying on flawed intelligence (and against the wishes of the majority of the British people, including those of us who took to the streets in unprecedented numbers to protest) we came to the conclusion that we could not in all conscience vote Labour in the next election. Walter was quite noticeably distressed at this, and said he too opposed the War, and Tony Blair, but that the body of the party was greater than one man. For some time afterwards, Walter posted copies of the Labour Party newspaper through our letterbox. I thought of Walter again, recently, when I reflected that a man like him, whose values and principles underpinned a lifetime of service to the many, not the few, and core Labour till the day he died, would surely be a supporter, were he alive today, of Jeremy Corbyn. Walter was born in North London in 1920, and left school at 14. He cycled 14 miles daily to and from work in the rubber industry at Kingston-upon-Thames. At 16, he wanted to go to Spain to fight with the communist forces opposing Franco's fascists, but was prevented by his mother, who judged him too young. During the Second World War he served with the Royal Engineers in the 20th Bomb Disposal Division, and travelled around Kent clearing mines and disposing of unexploded bombs and shells. The work, and the death of many of his comrades left an enduring mark on him. He met his wife Joyce in 1941 when he was stationed in Tunbridge Wells. Walter was awarded a medal for his six years in bomb disposal, having continued this dangerous work for two years after the war. The family moved to a council flat in Islington after demobilisation in 1947, and the lack of affordable housing at the time fostered Walter's belief in the need for social housing. During an interview in 2002 he said "having a decent home is the basis of a good society". He was also a vocal advocate for the National Health Service, having been a witness to its birth. Walter was respected by members from all parties in local politics, and was renowned for his kindness, social conscience and straightforward opinions. He was well-known for his letter-writing efforts. In 1990 he hit the headlines when his anger at Margaret Thatcher's imposition of the flat-rate Community Charge (aka the Poll Tax) led to an appearance before local magistrates (his first ever!) for refusing to pay. He said "It was a bad law, and caused great hardship to so many people. I had to speak up on their behalf. It would have been easy just to pay, but I felt I had to go and speak up, I couldn't funk it." To further ram home his point in this fight which he could not win, he wore his war medals to underline his loyalty to those things in which he did believe. In early 2003, Walter wrote to the Queen asking her to halt the attack on Iraq, and Britain "being dragged to war by the USA." He was a staunch republican, and was disappointed by what he saw as the bland reply from the Queen's Chief Correspondent Officer. He vowed to write again to the Queen, saying that he thought the situation "too serious to wash your hands of." Walter was also deeply concerned with environmental issues, and his daughter Coral recalled that even as a youth, he would take home stray animals. In Southborough he campaigned successfully for the establishment of a local nature reserve, Barnett's Wood, plus a rolling tree-planting programme. Every year in all weathers he would go out to save migrating frogs from being killed on the roads adjoining the grass around Holden Pond, their ancient spring breeding grounds. He was also a keen supporter of the Kent High Weald environmental project. Walter never owned a car, but instead used a bicycle and public transport to get around. Walter described himself as a Christian Socialist, and held the view that he should help those in need. But he was no holier-than-thou stuffed shirt, clearly. Martin Betts recalls: "Walter loved people and he loved life... he laughed a lot - particularly at his own expense - and had that rare gift of making people feel good about themselves and had an amazing number of friends." He kept fit by swimming and weight-lifting, and described himself during a BBC interview, when he was identified as the oldest serving Councillor in Kent, as "a recycled teenager ... inside an old bloke is a young bloke trying to get out!" Walter died on 21 December, 2003 following a stroke. On the day of his stroke, he was planning to distribute funds to pensioners for Christmas. ​Recovering from particularly vicious flu, have been having some bird therapy today! Listening with full attention to bird song tracks while simultaneously looking at picture of each bird in my 1988 edition Book of British Birds (Readers Digest/AA). 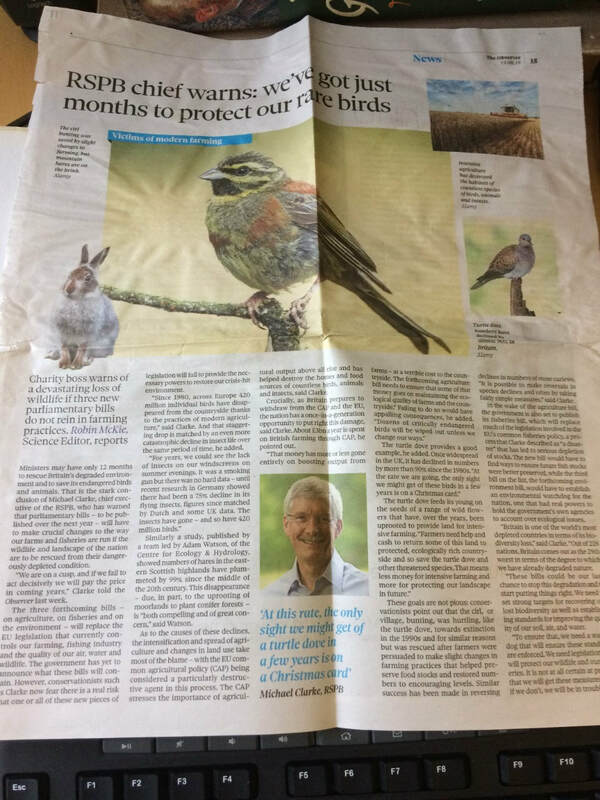 If you love birds as much as I do, please see below (courtesy of and thanks to The Observer - I clipped this from their 19 August 2018 issue), here is a damn good reason to buy organic foodstuffs. Twixmas - giving thanks for the last Christmas Puddings! I don’t eat sugar, so most of the year I don’t eat cake, but at Christmas time I look forward to making Christmas cake and puddings with some excellent (cane) sugar-free recipes. It’s sweet enough with all the fruit, and I get the organic ingredients from a wonderful cooperative in Hastings, Trinity Wholefoods. Before the New Year, I like to make one more for the house, and another for my son, daughter-in-law and granddaughters to tuck into on New Year’s Eve. I’ve had a really enjoyable morning mixing these up while listening to Cerys Matthew’s brilliant Sunday morning programme on BBC Radio 6 Music. I love this Twixmas time, when, for those of us who are lucky enough not to be working right through, there’s time for reflection, rest, and respite from the onslaught of life’s busy busy business. Joy and love for all you have done. Lastly, thanks to son Tom, who bakes beautiful loaves of bread, and gives them to us wrapped in greaseproof paper and string. I’ve recycled these to wrap the puddings for five hours’ boiling. Here’s a link to another Johnson Twixmas offering - it took a lot longer to produce, but equally tasty for bookworms who love a good creepy tale! I graduated with an illustration degree and went on to work in a variety of historical sites, art galleries, museums, art/print companies, always keeping the love of art and books at my core. I've now been working as a Library Customer Service Officer and Registrar of Births and Deaths for a few years. I love being able to talk ‘books’ with people and encourage others of all ages to read (including my three year old son). Being an avid reader, I'm now surrounded by books of all kinds on a daily basis. Was this career move just so I could get my fix without any effort?! It’s a possibility. Growing up I used to love being read books, especially at bed time, by my mother but never really enjoyed the idea of reading them myself. It seemed like too much to take on. I didn’t discover how a person could enjoy being completely immersed in a fictional world until I was about 18 years old when I was given Alex Garland's ‘The Beach’. This beautiful yet brutal story seemed to grab my attention and appeal to my young self as I was transitioning into manhood, on the cusp of discovering a solitary freedom and independence in a world that can hold so much possibility yet so many hidden dangers. After a year living abroad and while returning to England I began to read this on the plane. I continued to read it hungrily once back home. I can honestly say that this book permanently changed my view of the world and culture we live in. After finishing it I remember feeling almost desperate to do something about the selfish and devastating way we're blindly stripping this planet in order to feed our rapidly growing population. Quinn’s powerful message is carried across perfectly on the fictional story of a character who becomes the pupil of... a gorilla. Quite a few books have been recommended or given to me by my oldest friend Tom, but this one ended up being by far my favourite. It’s the first story of the Earthsea Quartet and it follows the first part of Ged's life. A boy with a considerable gift in magic who struggles with himself to become the man he wants to be (or is destined to be). Beautifully composed, I believe Le Guin's writing is inspired by various anthropological and theological studies which allowed me to connect to Ged's character and the world he lives in on a more personal and spiritual level. This book was a birthday gift from my wife, and since reading it I have become a huge fan of Gaiman's writing. The main character of this book is a child living in a country village whose family is infiltrated by a character of increasing menace. He also befriends a very unusual little girl. It reminded me of my days walking in country lanes and fields and visiting friends in country cottages. Gaiman's ability to blur and skew the lines of reality in such simple ways had me very quickly falling in love with this story. In my early 20’s, and never having read any of Wells's work before, I began to read this at a friend’s house and I later bought my own copy. At first I felt unused to the old fashioned language, but after the unearthly events started to unfold I was unable to stop reading. I was stunned at how a man writing this in the 1890’s could even imagine such terrifying and effective alien technologies. He seemed to show how fragile the human race was at a time when the British Empire was seemingly at its proudest. I was and still am truly awed. It’s no secret I love books. When I worked at a girls’ boarding-school, the librarian would from time to time alert staff that old stock was being deleted, at which point I would beetle down The Long Corridor to the library, heart beating fast with pleasurable anticipation, and stagger back with armfuls of weighty tomes. Food in England, published in 1954, was one such - 662 jam-packed pages of fascinating historical details collected by an eccentric Englishwoman, Dorothy Hartley, who died aged 92 at the house in Froncysylltau she inherited from her Welsh mother, after a lifetime collecting and recording old customs. She trained as an artist, taught art, worked as a journalist and wrote on social history among other things. In 2012, Lucy Worsley made a film exploring her life-story (see link below). Food in England is a treasure-chest of marvellous, personally-researched and idiosyncratically-ordered recipes, old customs, ways of growing food, etc, and I consumed it at the rate of a page or two a night - slow reading, if you like. I’ve usually got a selection of books going at any time - a novel, a non-fiction, a spiritual readings book, and, the last year or so, a vintage Ladybird book - a four-course meal for bookworms! ​Here’s a baker's dozen of fascinating tasters from the book which might tempt you to acquire a copy. The beautiful illustrations are by Miss Hartley herself (a fact I was unaware of until I finished the book and researched the author - among my jotted reading notes I find the indignant remark - ‘artist not credited!’). The history of white bread, and the pre-Reformation belief in the power of consecrated bread. Thumb bread ... the American word "piecing" for a snack taken in the hand, has been preserved since it left England with the Pilgrim Fathers. In Yorkshire they still speak of a "piece poke" for a dinner bag. Recipe for 18th century Coconut Bread and for Famine Bread (from Markham, ingredients including Sarrasins corne , or Saracen's Corn). Description, from sixteenth century journal, of a sea-voyage when the sailors came upon a fifty year old gibbet, used to hang mutineers, from which their cooper made drinking tankards for those "as would drink in them". Ox-rein for Clockmakers - the long testicle cord of the bull ... was hung from a hook with a heay weight to stretch it out. Its strong gut texture was used as pulleys in some sorts of grandfather clocks. The middle-class Victorian household 1800-1900 section includes mention of brisk exercise before breakfast, which brought to mind the old ladies I met when I was alumni officer at the boarding-school where Enid Blyton's daughters were educated. Girls in the 1920s and 1930s were required to run to the village and back (3 miles!) before breakfast every day. The old Welsh dog power churn wheel ("It is no hardship, the dogs turn up their job as gladly as their fellows turn up for their job with the sheep"). The Queen's Cheese recipe (1600), to be made between Michaelmas and Allhallowtide, and a huge cheese, nine feet in circumference, made in 1841 for Queen Victoria from one milking of 737 cows. Last but not least, for fellow diehard fans of Patrick O'Brian's Aubrey and Maturin novels - the recipe for soup squares, surely Dr Maturin's portable soup! ​I look forward to foraging in second-hand bookshops for her other works - Life & Work of the People of England (6 volumes) sounds right up my street. The Coliseum, Brecon - a delight! On a recent visit to Wales to visit friends and family in the Valleys, we spent some time in Brecon including a rainy evening when we took shelter in the Coliseum Cinema and saw the new release Bohemian Rhapsody. Neither of us were massive Queen fans, though I've always enjoyed the old favourites, particularly on drivetime radio, but the film was extremely entertaining, and doubly so because of this cracking little cinema. Opened in 1925, when our mothers were both one-year-olds, it is still going strong at 93 years of age, with its original facade, foyer and interior decor. No chilly, faded flea-pit either, but lovely and warm, with seats brightly re-upholstered in red velvety fabric, clean loos and a welcoming staff - and everything any lover of cinema could wish for, including great sound and vision (I'm fussy about that!) with nice vintage touches like proper cinema tickets that spring out from a metal slot at the pay kiosk, a bijou sweets counter and an usherette in the aisle selling ice-creams from a traditional tray between the adverts/trailers and the start of the main feature. There are two screens, and the cinema also hosts the Brecon Film Society, whose 2018-2019 season includes a selection of 'the best new releases and classic movies from British and World Cinema' - usually shown on the first Monday of each month. At £35 a year (£30 concessions) it's great value, with non-members welcome at £6 a film. I've blogged elsewhere about the wonderful Cinema Museum in London and other loved cinemas. Most of the great Valleys cinemas have long gone, and apparently the multiplex at Merthyr Tydfil has lured some locals away with its offer of £5 a pop and a two-for-one eatery next door, but that's a 36 mile round trip, and if I lived in Brecon I'd definitely support this beautiful old cinema, whose demise would be a sad loss to the community. When my favourite item in the Waitrose Weekend paper (My Best Books) was chopped to just one book a week from five, I really missed it - I just love to hear what other people rate their cherished reads, so I decided to start my own guest-blog. Many thanks to Sara Browne for agreeing to be my pioneer! Sara trained at CSSD and was an actor for many years before changing career in her fifties to become a lecturer in Early Years and education. She currently works for Beanstalk, a children’s reading charity, training volunteers to turn children who struggle with reading into passionate bookworms. I paid 3d for this at the village fete when I was 7. I have read it dozens of times. Who did I want to be? It was either Posy, because she danced so brilliantly, or Pauline because she was beautiful and got to do theatre and eventually the movies. Nowadays I fully appreciate the efforts Narnie made to hold the family together, but I don’t want to be her. Maybe I could be Petrova and fly planes; maybe I should read it again and find out. This was the first of her novels that I read, tempted by the statement that she was “underrated” and “neglected”. She works on a very small canvas: mid C20 Middle England, academia, the church, awkward romances. It’s a safe, Pinewood Studios world, but not without depth and wit. I have laughed out loud at some moments and characters. I had an occasional email correspondence with Nigel Slater before he got swallowed up by Twitter. I once told him that I read this book of his from cover to cover, as though it was a novel, and he was delighted. It is almost twenty years old now, and he will admit that food tastes and fashions move on, but he consistently reeks of warmth and pleasure and variety. Keeping Smarties in the basic store cupboard is just one of his strokes of genius. A dear friend sent me this. It is bizarre, surreal and enchanting. The protagonists set up a situation for a joke and then tie themselves in knots trying to justify and then reverse it. The suspension of disbelief is key here. I believe in Miss Hargreaves, but like Norman and Henry, I don’t have any rationale. Enormous fun. I loved this book so much when I first read it that I saved reading it again for a time when I could pay it fullest attention. It is very romantic, so brilliantly evocative and so clean and spare in style. I send copies to people all the time, sharing the joy.